Many people told Breitschwerdt that Mercedes should not make a small car. He is glad he didnt listen. When Mercedes-Benz launched the so-called Baby Benz in 1982, Werner Breitschwerdts reputation was on the line. The 190, the forerunner to the C class, was Mercedes smallest and most affordable car. As chief engineer, Breitschwerdt took a great risk championing a car some felt would not match the quality and performance of the companys larger sedans. A lot of people said you cant make such a small car like that as a Mercedes, but we showed we could do it, and it was a very good Mercedes, the Stuttgart native told Automotive News Europe. A year after the 190 was launched Breitschwerdt was promoted to CEO. High demand for the car helped Mercedes boost its global unit sales to 604,447 from 481,845 during Breitschwerdts tenure as CEO from 1983-1987. The success of the car is one of the reasons that Breitschwerdt, 81, has earned a place in the European Automotive Hall of Fame. In March, he will join three other Class of 2009 inductees in the Hall: Ferrucio Lamborghini, prolific independent sports car designer Giovanni Michelotti, and Hub van Doorne, the founder of car and truck maker DAF. Breitschwerdt joined Daimler-Benzs car testing department in 1953. During a career that lasted four decades, Breitschwerdt says he had many memorable moments. One of them came in 1974, when the talented engineer became head of design in addition to director of car body development. As Daimler-Benzs chief engineer Breitschwerdt led the development of the flagship S class, the W124 series -- predecessor to the E class -- and the SL series, all cars that helped to cement Mercedes reputation as an automotive engineering and design leader. My job was making cars and it was my hobby as well, he said. After four years as CEO, Breitschwerdt stepped down from the job shortly before his 60th birthday. 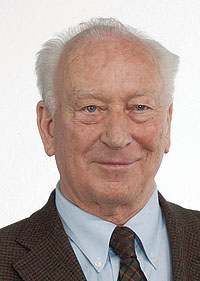 He served as a member of Mercedes parent Daimler-Benzs supervisory board from 1988 to 1993. Since leaving the board, Breitschwerdt has remained a popular figure in the industry. Despite the current economic squeeze, Breitschwerdt is confident that cars produced today by his former employer will remain popular.